The last time I tried braids was in 2010 when I went back to Nigeria for vacation. The takeout process was extremely painful, so I never bothered getting it done again. Recently though, I was looking at all the different braids and my girl Katy had jumbo braids done which looked amazing so I asked her how she did it. That's when I found out about Marley Braids/ Twists. Braids/twists are a great protective hairstyle when transitioning as you don't need to manipulate your hair for quite a while. 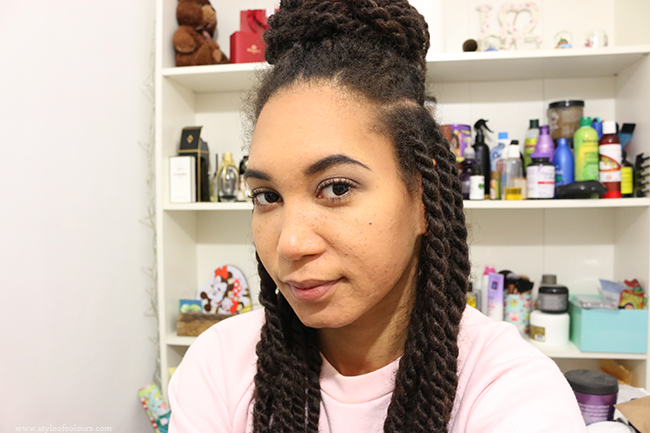 The Marley Twists were my favourite from all the videos and posts I saw because they look a lot more natural. I ordered 5 packs of marley hair in Medium Brown from Diversity Hair. When they arrived, they looked smaller than I'd expected, but I didn't want to wait to order more so I decided to just do them with the 5 packs. I watched some youtube videos on how to do the invisible root method, got everything ready and began the process. This was my first time doing them myself and all in all it took me 8 hours. I spent quite a bit of time practicing as I couldn't get the twists right at first, but after a few tries, I began getting the hang of it. I think the longest part of the whole process was prepping the extensions. I wanted the braids to be big so I divided and combed the hair slightly before twisting. I've had the twists in for over a week and I love them. There are lots of different ways you can style them and I don't need to worry about braiding my hair every other night to blend the textures. The only problem I have with them is washing my hair. My hair is so used to being co-washed every 3 days that I just couldn't take it and co-washed on the 5th day. Obviously this means the roots now look a bit messy, but oh well better than having an itchy head. I'm going to redo a few of them in front so it looks better and try to keep them in for about 3 weeks before taking them out. I'm not sure how the takeout process will go this time around, but hopefully everything will be fine. Because based on that, the decision on if I'll put the twists/braids in again will be made. If you have any tips on how to do the braids/twists, how to manage them or how to take them down, please let me know. I'd love to hear your ideas as I am a total newbie when it comes to such braids.